I want to replace my BMW 3-Series diesel with a used, petrol vehicle (car or SUV) that is quick and very comfortable to drive, and which retains its value as relatively well as possible. I have a budget of around £30,000. I’m leaning towards a low mileage, 4 or 5 year old BMW 6-Series convertible. What do you suggest? We don't have a lot of feedback on these and I can only remember driving one once. 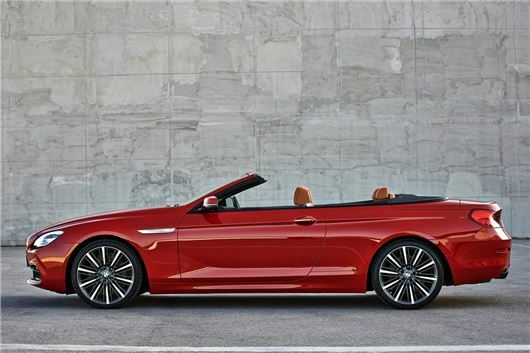 This is what comes up in our system: /used-prices/BMW/6-Series/?q=Convertible / For comfort, you need the smallest wheels with deepest profile tyres available. We don't predict value retention, but what's in the link should give you some idea. Another possibility is a Mercedes E63 AMG: /used-prices/Mercedes-Benz/E-Class/?q=AMG+E63 / If you really wanted one, you could get a Bentley Continental for that sort of money, but we don't have any in our search. Autotrader will. Another possibility is a Maserati Quattroporte that has dropped so far it should start coming up again. I wonder if you can help as I’m a little confused and irritated regarding the EA189 NOx emissions service my VW Passat estate apparently needs and the VW Scrappage Scheme. I haven’t had the NOx fix ser as suggested by VW due to the after-effects that people have experienced with their cars. Instead, I looked into the Scrappage Scheme but find that, as my car is a ‘Euro 5 emissions standard engine’, not a ‘1-4’, I am not eligible for this Scheme but obviously have an affected vehicle otherwise I wouldn’t be being hounded by VW to have the upgrade. I was under the impression that the Scrappage Scheme was linked to the emissions problem? Am I missing something? Wrong impression. Scrappage is nothing to do, with the EA189 NOx emissions fix. It's to sell new cars by getting rid of older diesels. VAG is now committed to fixing anything that goes wrong as a result of the fix, including EGRs, injectors, etc. Still up to you, but I'd have it done. In marked contrast to our lovely old low mileage Peugeot 407 coupe (which seems to steer itself), our Jazz, with its electrically powered steering, feels stiff to turn in the straight ahead position at any speed above 30 mph. We like the Jazz (with CVT and paddles) and would wish to keep it. But because its aim requires constant correction, we find it is very tiring to drive on a longer journey. Leatherhead Honda, having checked geometry etc., tell me they have driven the car and it is faultless. They say the Civic steering is the same. Should we get an independent engineering opinion and tackle Honda with it, and/or would we find other newer similar size cars have the same steering characteristic, if we changed to one? We remember that Honest John has at the time liked both these cars; so I seek your advice please. We have a Jazz 1.5iVTEC 5-speed torque converter auto (a non-UK model), now sitting at 133,000 kilometres. It came on 17-inch wheels and modified suspension that translates to virtually no suspension at all. The 17-inch wheels and tyres soon scrapped themselves and were replaced by 15-inch with 195/55 R15s and it actually steers very well, is practical, spacious and reliable. If your electric power steering is playing up, get it independently tested by a non-Honda garage. These are the reported Freelander 2 problem areas (I'm afraid it's a long list): /carbycar/land-rover/freelander-2-2006/?section=good / If it's automatic it might be the transmission. Otherwise the rear diff. From the beginning, the clutch of my 2013 Ford Fiesta Powershift has been shuddering. I drove it as is for a few months and then Ford send out a notice for repair of clutches. A few months later, it’s happening again. Based on advice seen on YouTube, I would drive at speed when I can on the highway, and the shuddering would disappear. This dual clutch can be tricky. As long as I put my foot firmly on gas when inching in traffic, the shuddering isn’t too bad. So I treat it as a manual and drive it like one, except I don’t get to shift gears. I don’t know much about the technical workings of cars and am out of UK at the moment and in Asia. So my question isn’t UK specific, but rather Ford Fiesta specific. At 5 years old, could you please advise what I should have the car workshop look at and replace at 31,000 kilometres. I now commute daily and average a 100km a day. Frankly I am terrified of going anywhere out of the city in case something goes wrong and I am stranded. But I don’t want to sound like an idiot and get fleeced by the workshops here either who will think a woman knows nothing and just tell me to change parts that don’t need to be replaced. What are the parts that I should be concerned about at this point? Although my finances are tight, I have also thought about trading my car in for a Mazda CX-3. Would that be a good choice? When it rains in Asia, it pours and flooding is a common happening. Thanks so much for your input, I desperately need it. There is an admitted problem with the twin dry clutch packs of Getrag Powershift transmissions fitted to Fiestas, Focus, Ecoboosts, etc. Ford has been warranting them for 5 years, but yours may be outside that warranty. Depending on where you are emailing from you may be protected against known faults by your country's consumer laws. Happily, in the new Fiesta, the Powershift has been replaced by a 6-speed torque converter automatic and that’s what you get in the Mazda CX-3, which I rate as the nicest small SUV. I have a VW Golf automatic, 6 years old, 45,000 miles, regularly serviced. It needs a new gearbox. Is this normal, or to be expected? I believe that it is a manufacturing problem. What advice can you give? Two years ago I bought an ex-demonstrator 4-Series BMW from my local dealer, we have bought 8 cars from this dealer over the last 12 years. In June it developed a fault with the aircon. It went in 4 times and the fault was never fixed. In October, they took the car in and said they would keep it until they knew they had solved the problem. That was 4 weeks ago and now they admit they have no clue and are in discussion with BMW HQ. If this issue cannot be fixed what is the likely outcome? The car is still in warranty for another 5 months. The car might have the new R1234YF a/c refrigerant instead of the previous, cheaper and more reliable R134a refrigerant and, if so, this will be what is causing the problem. It is leak-prone, flammable and expensive. Legislated into cars by EC Directive because, apparently, it is more environmentally friendly, though I suspect some heavy lobbying by the manufacturer of the gas. My wife and I bought a 2008 VW Golf TSI from a local dealer who sells cars as a sideline to his main business as a 'hobby'. It was high mileage: 138,000, but supported by a full history from a VW specialist and we took out a warranty from the dealer that he said was 'cast iron.’ We rarely used the car for the first month or two for anything other than short local journeys, but we noticed in the second month of ownership a noise from the front offside on acceleration on the motorway the first time we took it past 60mph. We had the car looked at by a local specialist who diagnosed a gearbox fault that the warranty company refused to cover as it was worn, not broken. The garage argued the case and apparently the warranty company were thoroughly unpleasant. The upshot is, we spent £1,000 getting it fixed and the car had not been in our ownership more than 3 months. It seems almost certain that the fault existed when we bought it. I realise I probably should have contacted the dealer to offer him the opportunity to put things right. I now realise that it's been over 6 months since we bought the car and my rights are probably diminished. I wrote to the dealer a few weeks ago explaining the situation and suggested he refunded the warranty cost as a goodwill gesture but would I have any rights for recompense? If so where should I head to or what should I have done differently? Too late. Obviously you can expect wear and tear on a 2008 car with 138k miles and faults that existed or were developing prior to the warranty being taken out cannot be covered by warranty anyway because that would be fraud. Had you taken it straight back to the supplying dealer and held him liable you might have had a case. We love our Skoda Yeti 1.2TSI Elegance, which is just 3 years old. It is the second Yeti we have owned and it suits us very well. We have usually changed cars every 3 years. We live in Devon (narrow lanes, etc.) and we have a dog. Unfortunately Skoda has discontinued the Yeti and its replacement, the Karoq, is quite a bit wider and much more expensive. Our local Skoda dealer has no more new petrol Yetis available. However, we were offered a Skoda Fabia 1.0TSI Estate at a price of £15,490 instead. We were offered £9,000 for our old Yeti, which has done 34,000 miles. It seems a good deal, although the driver position is much lower (the height of the Yeti's driver position is excellent). The alternative is to keep our old Yeti another year and see what happens. Have you heard of the eBay Vehicle Scam Alerts group on Facebook: https://www.facebook.com/search/top/?q=ebay%20vehicle%20scam%20alerts / It is run by ‘Jack Buster’ (probably not his real name) who seems to be the only person in Britain who tries to get people’s money back after a Bank Transfer Fraud on eBay or Gumtree. This group is taking down scams every day on eBay and Gumtree and preventing people from sending money to fraudulent bank accounts. Some people are still being caught out, though. I know someone who lost £10,400 in this type of scam trying to buy a VW campervan. Most of the scammers are Romanian (this is not racist, it’s a fact). I thought you might like to check it out. Not only does Jack Buster try to get your money back on a no win no fee basis, he actively takes down thousands of scams a week by his group alerting eBay and Gumtree. The banks that open the fraudulent accounts are not being helpful. I know that ‘Jack’ doesn’t make much money from doing this but he was scammed for a lot of money himself before becoming Jack Buster. I was lucky when I bought my T4 on eBay. The seller was honest, but if he hadn’t have been, then yes, I transferred £4,750 by bank transfer to him before I had the vehicle in my possession, so there but for the grace…..
No I hadn’t, but that's great. Jack Buster is performing a valuable service. I do use eBay and do have a PayPal account, but only use it for items under £200. Never had any problems because of the way eBay purchasers give feedback on eBay vendors, but can see how a purchaser could fall foul of the system buying a high ticket item from a new eBay vendor. I have been a SAAB fan for many years now. My last I had from new in December 2010 and it is a SAAB 9-3 TTID 160 Diesel. It has now done close to 150,000 miles and I am at the point that I need to change it, but I have no idea what to change it for now that SAAB is no more. I have always had a diesel as I do a high mileage, but with the threat of taxing diesel cars and charging a fee for travelling into some cities (which I do) would now be the time to change to a petrol or maybe a hybrid car? I know that this car is a year too young to qualify for diesel scrappage schemes and that it is probably not worth a whole lot due to the high mileage (although it has been and remains -fingers crossed- a reliable car). I would like something of a similar size to the 9-3 as it fits into my garage and I feel comfortable driving the routine long journeys in a car this size. I need an automatic car. Your suggestions for an equally reliable and perhaps a more cost effective car would be appreciated. I have looked at Skodas and Hyundais, but am uninspired so far (although I did quite like the look of the Tucson). A new Toyota Prius on 15-inch wheels: /road-tests/toyota/toyota-prius-2016-road-test/ Or an Auris hybrid. Not the PHEV. At your mileage there is no benefit. The sales of new cars has dropped dramatically since the last budget raised road tax for most new vehicles. But, I am nearly 65 years old now and even though I spent most of my life working with computers (I was a computer operator in 1973 when most people had never even seen one), I feel that the amount of technology in new vehicles puts me off buying them. I have two vehicles. . One is a 19-year old Volkswagen T4 with wind-up windows and no central locking or aircon, which I love. I also have a 2010 Honda Jazz 1.4 EX, which I think has just the right amount of tech. Entertainment system with USB socket to play from a memory stick, nice to drive, climate control, automatic wipers etc. I don't like the automatic headlights but I can put them on manual. If I keep them on auto, when there is fog or rain during the daylight, they stay off. They only things I wish I had in both vehicles are parking sensors all round and ABS in the T4. But new cars have keyless entry and start buttons, which makes stealing them easy. They have Internet connections that can be hacked. They have WiFi, which means that while driving in your metal box, you are being bombarded by EMF radiation (you wouldn't sit that close to your WiFi at home). They have automatic braking, etc. Well my Jazz has brake assist and on a couple of occasions it has braked a lot harder than I expected when something has happened which caused me to stab at the brake pedal, but then release it as the hazard cleared, and I once drove a Lexus that did a complete emergency stop when I braked a bit hard. And all this tech will go wrong and will be uneconomic to repair, not to mention Diesel Particulates Filters which means that you can't use diesel vehicles for short journeys. I hate DRLS. Neither of my vehicles have them. They mean that you can't just sit in your car when it is parked and listen to the radio eating your lunch without it lighting up like a Christmas tree and attracting attention. Plus DRLS which only come on at the front encourage people not to use their lights when it is dark enough or raining or foggy, to need your rear lights on. And I don't want to buy a vehicle over forty grand thanks to the £450pa road tax. I have looked at quite a few vehicles including cars and the VW California. Every time when I sit down and think about it, I prefer the vehicles I have. And, as for home, why would I want a washing machine or fridge connected to the Internet. I have now found that Smart Meters are dangerous. I just think that technology that used to attract people is now putting people off, or at least putting the older generation off. Also, I think a lot of automatic gearboxes, especially on really powerful cars, are dangerous as if you press the wrong pedal, things would happen so fast. Look at how quickly a Tesla can accelerate. I am now retired. I had a lump sum from my pension. I could buy an expensive car, but I think I will just keep my 19 year old T4 and my 7 year old Jazz and spend the money on something else. Sorry, I have been rambling on again but I hate the way the car industry is going. It's planned obsolescence. Manufacturers uses to use rust for this. Now they use tech. Cars are built to last 7 years. If you think about it, how many 60s and 70s cars lasted longer than 7 years? They usually fell apart by then. The 'classics' you see that have survived (often at expense ten times greater than their original prices) are a tiny percentage. Current cars go the same way because the tech in them fails. The only manufacturers prepared to even warrant their cars for 7 years are KIA, Ssangyong, and now Chinese built MG.
Hahaha, it has wifi so you get bombarded with radiation! What a nugget. He is correct, whether you want to argue about safe levels is something else. King Luddite isn't the only one who has no interest whatsoever in the typical new vehicles currently for sale. Both our vehicles are from the early and mid noughties, so both 90's designs, from which ear many makers have cars that just soldier on and on. My answer to the problem is extensive rustproofing and way over the top maintenance in order to keep these vehicles running for as many years as possible, both made in Japan. I have no intention of being forced to have an electric parking brake, nor will i be having any of the weird and wonderful supremely unreliable and thoroughly unpleasant to use automated manual gearboxes no matter how many clutches they boast. Nor will i be buying into a tub of goo and a toy inflator instead of a proper spare wheel, and if they think they're ever going to charge me for a spare wheel and jack, they can jolly well think again. "My wife and I bought a 2008 VW Golf TSI from a local dealer who sells cars as a sideline to his main business as a 'hobby'." Is not that a contradiction in terms? Either he is a dealer or he is not, it's like saying Elton John plays the piano "as a hobby". "...I don't like the automatic headlights but I can put them on manual. If I keep them on auto, when there is fog or rain during the daylight, they stay off..."
Rule 226. You MUST use headlights when visibility is seriously reduced, generally when you cannot see for more than 100 metres (328 feet). You may also use front or rear fog lights but you MUST switch them off when visibility improves (see Rule 236). "Also, I think a lot of automatic gearboxes, especially on really powerful cars, are dangerous as if you press the wrong pedal, things would happen so fast. Look at how quickly a Tesla can accelerate"
Aside from the fact that Teslas do not have an gearbox, automatic or manual, pressing the wrong pedal is use error, not the fault of the car. I too was in IT (or Data Processing as we called it then) during the seventies and the letter suggests that our ex-operator friend was typical of the breed. Knowing a lot, but understanding little.